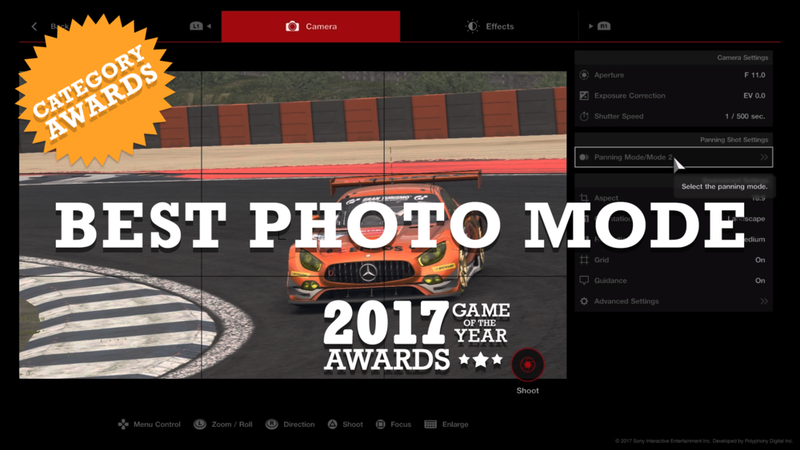 A new award for this year, Best Photo Mode recognizes the increased prevalence and widespread adoption of in-game screenshot-taking tools and uploading capabilities in this generation of games. While Microsoft, Sony, and Nintendo have all added one-button screen capture options, some games go the extra mile to include tools to adjust the game image and truly create stunning pieces of art. The creation of the category acknowledges the recent growth, but as it turns out, our winner is from one of the console series with the longest history of screenshot sharing. Gran Turismo Sport takes the award because its photo mode is detailed, includes options for both in-game and static screenshots, and includes sharing options within the game. This is hardly a surprise; the Gran Turismo series is a forerunner in photo mode development, starting with Gran Turismo 4 on the PlayStation 2. While that can seem old-hat, the user-friendliness of the DSLR-style photo controls and graphic filter adjustments improve with every iteration of Polyphony Digital’s racing series. Additionally, GT Sport includes further improvements on the static image front, making use of a plethora of things they call “Scapes,” which provide static backgrounds of all types. The amazing thing is how well the cars of GT Sport blend into the high-resolution real-world scenes. The results are spectacular. Best of all, you can share photos in-game with your friends and followers. A well-integrated social layer allows easy sharing of in-game screenshots, and GT Sport also allows downloads of high-resolution JPEGs to USB devices.